And finally, we have the first of (unfortunately) probably very many entries under the heading of Science Reporting Today. That is, how god-awful it often is. The big dino news today has been the paper by Darren Naish, Matt Wedel, and Mike Taylor (all of the glorious SV-POW! blog) that, contrary to studies in the early 2000s, sauropod necks were not constrained to a horizontal position. Note that, if you read the papers or their own blog posts, they're very careful to spell out that this is not to say that sauropods are just going from one constrained pose to another. I read one comment on a news story, where some poor dim soul honestly said the new study must be bogus, because if they held their heads up high, how did they drink? For serious, a human being, presumably without any mental defects, said that. For a second I thought I'd been frozen for 500 years and woken up in Idiocracy. Generally, the problem with science reporting, as detailed in the comic I posted a few days ago, is that science reporters, who are rarely specialists in whatever particular area they're reporting on, must not only interpret the information given to them by experts, but they also feel the need to severely dumb the info down for a general audience (and, often, try to spice it up or over-exaggerate the importance of discoveries, so people who aren't interested in science will be impressed. See exhibit A). Here are some examples of news stories discussing today's sauropod neck paper, and either getting things wrong or dumbing it down so much that they're misleading people rather than educating them. Really? Generations of children. When I was a kid, every dinosaur book and toy I had depicted sauropods with an erect neck posture. This is the stereotypical brontosaur image, after all. This is the posture that lead people to mistakenly surmise that sauropods lived under water and used their long necks like snorkels. In reality, though some older museum mounts depicted sauropods with horizontal necks (mainly due to lack of ceiling space), the low-slung, horizontal necks didn't gain popularity until Walking with Dinosaurs was released in 1999. Ten years is hardly "generations." This is an example of exaggerating the impact of a find. It's important, sure, but not that earth-shattering, as its overturning a view that's only been entrenched a decade. 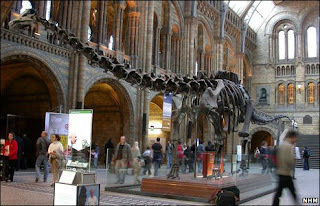 Natural History Museum's sauropod exhibit 'anatomically wrong': The Natural History Museum's flagship dinosaur exhibit may be misleading because sauropods held their heads up high rather than keeping them low, claim scientists. "May be misleading", well that's arguably true, but anatomically wrong? No. Of course sauropods could achieve a horizontal position. Here's an example of a headline making a bold, exaggerated, and incorrect claim, and only backpedaling if you read the fine print (i.e., the actual article). Anyway, those are just the first few examples I noticed. The SV-POWsketeers are keeping track of news stories about their research here, if you'd like to play along at spotting shoddy science reporting practices. If you find anything truly ridiculous, drop it in the comments! Also, bear in mind that this is not a criticism of science reporters per se. Whenever trying to communicate complex ideas in a simple way, you're going to mislead some people. Take a look at the graphic I did for the previous post (linked at the top). Big ol' red X over the WWD Diplodocus. What I meant to convey is that this is no longer the standard, default posture for these animals. Will somebody look at that and think I meant they could not hold their necks horizontally? Unfortunately, it's possible. But maybe it's a problem inherent to the whole approach all the science news outlets seem to be taking. Rather than "New discovery disproves conventional view of sauropods," wouldn't a better tack be, "New discovery shows sauropods had greater range of neck motion than previously thought"? Or does that not sound earth-shattering and controversial enough for Joe Average to care? Hi Matt, nice work pointing out some of the...excesses...of the media coverage. I too have had some Idiocracy moments. The best bits of coverage have been those where Mike or Darren could actually respond and explain what our work does and does not say. In the words of Brian Engh, this is our struggle. Idiocracy was a good movie. Er shouldn't that be Matt Wedel as one of the SVPOWsketeers? Yes, er... Mark Witton stole my password and sabotaged the post. Damn you Mark Witton! Good ol' sauropods. I remember when I was first misinformed about the standard sauropod neck posture. Sadly I am a very gullible person, but even stiil it took me a while to fully accept what so suddenly people are telling me is wrong. Like I said, very gullible. I need to work on that a bit. @ Rick Charles: Well it's not an issue of gullibility. The horizontal-only pose was accepted because that's what the data tells us. Science isn't about finding "the truth", it's about finding out which hypotheses have the most support. A few weeks ago, the bulk of published support was in favor of the fact that sauropods could not lift their necks into the air. This new paper casts doubt on that. Don't go accepting this one as gospel either, we still haven't heard a response from Kent Stephens and crew, which is currently forthcoming. Sorry, late to the party. Naish is indeed 'naysh', not 'nash'. Put Your Heads Up For Detroit! Four Wings Bad, Two Wings Good?